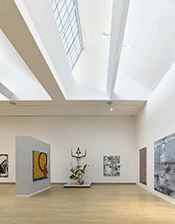 Aerogel monitor skylights were successfully installed in the world-renowned Crocker Art Museum to maximize daylighting performance. The Crocker Art Museum was originally established in 1872 when Edwin Crocker renovated an existing structure into a Victorian Italianate mansion for his family. He built a gallery in matching style next door to display his expanding art collection — and it subsequently grew to house about 14,000 works of art, including Early California art, Old Master drawings, and Asian pieces. More recently, the gallery needed to be extended because its existing 45,000 square feet (4180 meters2) were cramped. The project plan called for a dramatic 100,000 square feet (9290 meters2) extension and renovation. One of the most important considerations was daylighting. The architects' solution was to install 15 Kalwall+ LUMIRA® aerogel monitor skylights. Here, the Kalwall+ LUMIRA aerogel system provides glare-free, balanced daylighting to eliminate harsh shadows while offering true and accurate color rendition. UV-stable over time, Kalwall also filters out damaging rays, protecting both the interior space and the often priceless objects within. The Kalwall+ LUMIRA aerogel product is the most highly insulating system available, achieving a 0.05 Btu/hr/ft²/°F or 0.3 W/m²K at Crocker — equivalent to a solid wall — while still offering a 22% light transmission rate. This performance reduces artificial lighting and HVAC expenses year-round. The Kalwall+ LUMIRA aerogel system also improves acoustic performance (up to 35 STC), minimizing unwanted noise. The architect set the monitor skylights to light the new third-floor galleries into the roof at a sharp angle, creating a dramatic sawtooth profile when viewed from outside. The museum now offers four times more space for travelling exhibitions and a threefold increase in exhibit areas for its still-growing permanent collection. Kalwall+ LUMIRA aerogel brings controlled, UV-filtered, natural daylight into the galleries and has played a huge role in making today's Crocker Art Museum one of the leading art museums in the country. According to addition/renovation architect Gwathmey Siegel & Associates Architects of New York, "The compositional strategy of the addition and renovation was to establish a new and unique iconic presence for the addition, while framing the existing complex in a visual and physical dynamic, creating a collaged image for both the new and historic structures."